Our quest to find the best burgers in Siem Reap resulted in some very thorough (and tasty) research. The definition of a good burger is very personal and expectations vary widely. Some, like the Joker, love a burger oozing sauce, which runs down your arm. Others love something more refined, even a bit sophisticated. Yes, you can get a sophisticated burger. For some the quality of the bun is a big factor. Extensive research went into the making of this post. And many burgers have been consumed across town to ensure we have a well-rounded account. The decision was not taken lightly. To start with it is not just our opinion but that of a group – we dubbed ourselves the Burger Appreciation Society – and the voting (yes, I told you it was serious) – made it very democratic. And every place was judged on four criteria: the burger; ambience; service; value for money. The winner of best burgers in Siem Reap went to Beatnik. Situated on the corner of Alley West and Street 11, just around the corner from Pub Street, it got a big thumbs up for ambience. You are right in amongst the action, close to the street and with plenty of entertainment around. And there’s always a great music mix playing. The service is excellent. The burgers average around $6.50 to $7.00 and come with chips. And there is a huge selection of burgers to choose from. For the Aussies, it’s the only place we’ve found in town where there’s a genuine Aussie burger including beetroot. It was the Joker’s favourite. My favourite was the gorgonzola, which oozed that strong blue cheese flavour. The lamb kofta burger was pretty good too. As a group, we visited Beatnik twice, to be sure we’d made the right decision and the Joker and I have been on several other occasions. REVISION: We heard there had been some changes at Beatnik so we revisited it. The five of us who were in the original judging party last year all agreed it fell down on three of the judging criteria — the burger; ambiance and service. We found there was less variety of burgers, though still a good selection. But they seem smaller (perhaps we are imagining it). Service was not great — slow to take orders; twice the request for no straw in the drinks was not met and some of the staff looked like they really didn’t want to be there and couldn’t care less. And what has happened to the fantastic music selection? They’ve also removed the plastic curtains they used to roll down when it rains and so when it did start raining we got wet. All up we were a little disappointed. On the plus side, the chips were AWESOME. And it is still the only place we know of that sells an Aussie burger (with beetroot). Jungle Burger was also very popular with our group. Like Beatnik, it has a huge variety of burgers to choose from. Also, like Beatnik, it includes a serve of chips and aioli. The chips are awesome and I’m always a sucker for aioli. The burger pictured is the avocado and bacon burger, which is delicious but not my favourite. I loved the blue cheese and bacon burger – yeah, there’s a theme developing isn’t there? 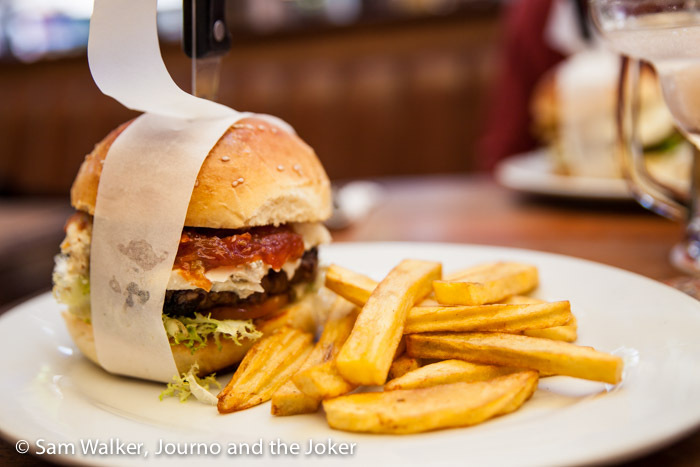 The Joker loved the big pig burger, which even he struggled to get through. But please, don’t let your children order the Bob Marley burger. We heard of someone who did this. Prices start at about $7.00 and go up to $10.00 for the most expensive. The service at Jungle Burger is also excellent and you are given those beautiful, refreshing, cold towels on arrival. Nothing better on a hot day. It is a sports bar, so expect a lot of sports fans and the TVs all running with various games, especially when there are big matches. You can find Jungle Burger on the east side of the river on 26 Street, between the river road and Wat Bo Road. 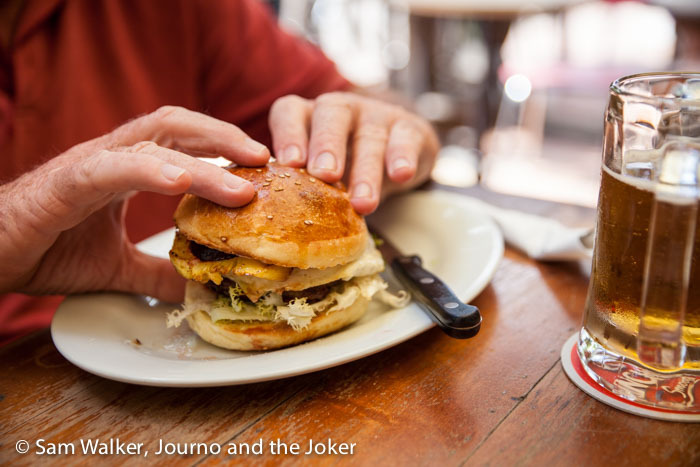 The Joker and I were away when the group visited Crocodile River Bistro, but by all accounts the burgers were amazing. We will get there one day to test them for ourselves. But those who visited reported huge portions, that were a struggle to get through. It seemed to be the place to go for a good priced double beef and cheese. Another friend had the pork schnitzel burger, which included two pieces of pork. The service at Naga Guesthouse was exemplary. The staff fell over backwards to accommodate our needs and were prompt with service and drink orders. The burgers came out quickly. From memory there are about six burgers to choose from. Not as big a choice as some other places but they were delicious. You’ll find Naga Guesthouse on Sam Dach Tep Vong Street, just down the road from the Hyatt. Worth a stop if you are after a good burger. Burger Gourmand scored the same as a few other places but I think they deserved to be placed higher so I’m putting them in as my number five. Perhaps, that’s not quite so democratic but we have been three times, twice with the group and once with friends so I feel I can pull rank. And when it comes to burgers, you are really spoilt for choice. I don’t think I’ve seen a more extensive burger menu anywhere. You can choose from a classic range of beef burgers but if you want something more exotic – or gourmet – you can choose from fish, lamb, chicken, duck and even foie gras burgers. There are vegetarian options as well but there doesn’t appear to be a vegan burger. The home-made buns are also delicious. Our first visit was within the first few weeks of opening and we were given the added bonus of a free dessert. The lemon crumble bowl is truly delectable. If you just want an awesome dessert, it is worth visiting just for that. In that first week the ambience was a bit average but they’ve put a lot of effort into making the space attractive and relaxing since then, although the chairs are not the most comfortable. But let’s face it, it’s hard to find comfy chairs in Cambodia. The service was amazing but the poor girl was on by herself, every time we visited and when it was busy she was rushed off her feet, which meant drink orders were a bit slower to come by. Burger Gourmand is on Sok San Road and is well worth a visit if you are after a tasty burger or a delicious dessert. These are our top five burger places. It’s worth noting that there are so many places in town that do burgers and we have not been able to visit every one. As a group we opted to go to places that had at least three burger options, which meant we could get a wider variety of opinions on the different burgers. We tried a number of lesser-known places and some other well-known places. It’s also worth remembering that the top five fared well across all four judging categories. Due to some requests I’m updating with a summary of the different categories. Not surprisingly Beatnik scored very high across all four categories and and was a clear winner in ambiance (90%) and service (93.7%). It scored equal top marks with Crocodile Bistro for the burger (85%). But fell down slightly on value-for-money (81%), which is interesting because value-wise I think it is on par with Jungle Burger. Jungle Burger scored very high across three categories – 83.6% for the burger, 83.2% for service, 89% for value for money. It fell down on ambiance at 69%. Perhaps because it is a sports bar. But it could just have been the individuals there on the night because it is has a nice area out the front. Naga Guesthouse came a very close second with service (90%) and the staff on the night were incredibly impressive with their attentiveness. Nothing was too hard. They scored 68.5% for the burger and value-for-money. The Crocodile Bistro won out with value-for-money with a score of 90% and scored equal top for the burger at 85%. Burger Gourmand placed second for ambiance (77.5%). We’ve had to do the scoring as a percentage because we had different numbers of people on each occasion. We happily admit our quest to find the best burgers in Siem Reap is an imperfect system and should be a guideline only. The best way is to go and try for yourself and make your own opinion. Sadly, I did not find a gluten free option – it is so hard to get gluten free bread here but I’m sure someone creative could come up with a good alternative. You’d be surprised how many people would be interested in this choice – especially if word gets out. And gluten free does not mean that it has to be vegetarian or super healthy – it just needs to be exclusive of gluten. Some kind of open burger served on a corn bread or polenta base? Just putting the idea out there. That said, I have just looked at Jungle Burger’s menu again and seen an option for a burger without a bun, which I might have to try next time. And there was one other place we visited where I ordered the burger without the bun. It was beautifully presented with the meat skewered with a few cherry tomatoes and a pickle but it was incredibly disappointing in the value-for-money stakes. A few more vegetarian options probably wouldn’t go astray either. What are your thoughts? 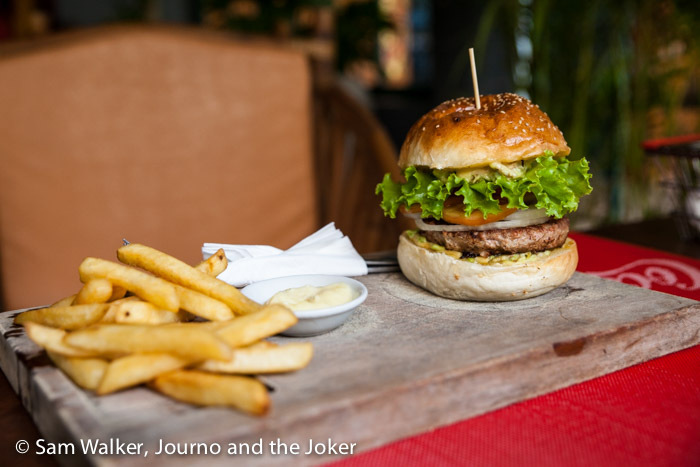 Where have you found the best burgers in Siem Reap? And what do you expect from a good burger? How come the joker didn’t take us there? Was it only over a couple of months? I thought we must have been to at least a dozen places! Oh, I was guestimating Sue. It was at least a couple of months. And we went to a couple of places twice. Thanks to you guys for doing this tough research 😉 Have you tried Mike’s Burgers yet? They are our favorite burgers here in Phnom Penh and they recently opened up a restaurant in Siem Reap! Definitely worth a try, and Mike and his family are wonderful people. Cheers! Hi Jen. Thanks for checking out our post. We did try Mike’s Burgers. Hi Jim. Thanks for taking the time to read this. we didn’t have a spreadsheet. Just a rough table formulated on someone’s phone. So I have worked out the individual percentages and I have updated the post with a summary of those scores. I hope that helps in your decision making. Go and enjoy some burgers! I love your photos, and am very fond of your writing! Burgers are always one of my favorite things to eat – wish I could try all of these from your post! Hi Sara. Thanks so much for the kind words. You have so many divine recipes on your site, I’m glad these places appealed to you.